When the Ohio Workers’ Compensation laws were written, one would have to think people like Sherry L. Redwine were who lawmakers had in mind. What is, or rather was, unknown was how far the benefits to someone in her situation would extend. Ms. Redwine was injured while working for Ohio Presbyterian Retirement Services, Inc. in 2003. The life-changing damage she was left with included, according to State ex rel. Ohio Presbyterian Retirement Servs., Inc. v. Indus. Comm. (Ohio Presbyterian), “lumbosacral strain, radiculopathy right lower extremity, aggravation of pre-existing degenerative disc disease, depression, and ruptured disc at L4-5 with free disc fragment.” Her psychological injuries were enough to qualify her for what is known as “permanent-total disability” under § (section) 4123.58 of the Ohio Revised Code. To qualify for this permanent-total disability, Ms. Redwine’s injuries had to be serious enough to prevent her from doing any sustained work, and that she will never make a full recovery. This does not legally prevent someone from doing any work, but the work can only be every once in a while, and not for a long period of time. No sustained wages can be earned. If an individual is able to do sustained work, the State believes she does not need permanent-total disability. There is another option known as “permanent-partial disability,” located in Ohio Revised Code § 4123.57(A). In this case, a disability has to restrict one’s ability to work but not totally prevent it. In Ms. Redwine’s case, she actually fit both categories. She had a psychological condition in the aftermath of her injuries that earned her permanent-total disability, and she began receiving disability payments in 2010. Three years later, she applied for permanent-partial disability for her physical injuries and was awarded it as well. This was the dispute in Ohio Presbyterian. Ohio Presbyterian Retirement Services went to court arguing that Ms. Redwine could not receive both permanent-total and permanent-partial disability. They had good reason to do so, because employers are the ones responsible for workers’ compensation payments. They believed the language in the Ohio Revised Code does not allow for concurrent workers’ compensation. Ms. Redwine argued that since the two disability awards were for different things, she was eligible for both. This, of course, would affect how much she was paid. In deciding the case, the Ohio Supreme Court had to take into account an Ohio Revised Code statute that says the workers’ compensation statute is to be interpreted as favoring the worker. This put Ohio Presbyterian Retirement Services at an immediate disadvantage. However, the Ohio Supreme Court mentioned a previous case that says courts cannot entirely “rewrite the statute,” or in other words stretch its meaning past what makes sense just to favor the worker. What seems to be the crucial factor in the Ohio Supreme Court’s decision was a case they decided 90 years ago. Industrial Commission v. Kamrath, as the court explained in Ohio Presbyterian, says that “an injured employee has a right to recover workers’ compensation benefits only as specifically allowed by statute.” The court looked to the fact that there are other types of workers’ compensation that can be earned concurrently, and since they are mentioned specifically, the fact that permanent-total and permanent-partial are not mentioned specifically as being able to be earned concurrently means that they cannot be given out concurrently. This is a common way of interpreting laws known as expressio unius est exclusio alterius. The significance of this ruling by the Ohio Supreme Court is that people who have multiple permanent injuries cannot receive multiple payments. The permanent-total disability payment is two-thirds of the injured worker’s average weekly earnings before the injury. Permanent-partial disability also awards two-thirds, but only up to 200 weeks. The percentage of the disability is the percentage of those weeks that are given. So someone with a 50 percent disability will get two-thirds of her average weekly earnings for 100 weeks. Ms. Redwine only gets the first calculation. No doubt for Ms. Redwine and others like her it is a difficult and unfortunate situation; it would frustrate if not downright anger a person left in that position. However, this ruling is for the best. The argument might be made that concurrent payments would make up for the payment only being two-thirds of the worker’s average weekly earnings. There are several problems with this. First, this is not the way to fix that sort of problem. If there is an issue with the payments, they should be fixed in the law, not through the commission handing out multiple awards and the courts consenting to it. That is the responsibility of the legislature. Second, this would be too narrow in its solution. Not everyone qualifies for concurrent payments as they were given in the case of Ms. Redwine. Someone who does not have multiple types of injuries could not get both payments. Again, it should be the legislature that changes the law. Third, there is not necessarily a problem with the system as is. The two-thirds payment does not include the other benefits, which include medical payments, rehabilitation, and funeral expenses. It also does not include other forms of government payments. However, all those costs would never have happened had it not been for the injury. It might be a better system to award the full amount or even more if the employer was at fault. The system is not a perfect one. But the Ohio Supreme Court had it right in deferring to the legislature. The discussion to change these laws may be a needed one, but the courtroom was not the venue for it. Cincinnati Area Insurance Companies Try to Choose Your Social Security Disability Attorney for You – Is This Good or Bad? If you suffer from an illness or injury that leaves you unable to work for an extended period of time, and you have long-term disability (LTD) insurance, there are some circumstances where your LTD coverage may affect the process of applying for Social Security Disability Insurance (SSDI) benefits. The LTD contract that you signed most likely contains a provision that requires you to apply for SSDI benefits while you receive your LTD benefits. Because this LTD contract requires you to apply for SSDI benefits, your LTD carrier will probably refer your case to a SSDI advocate firm or attorney whom they work closely with. This referral may be confusing to you because the LTD carrier may not clearly explain why they are making this referral. Because this process is not thoroughly explained, you might unsure how to move forward with this unfamiliar advocate group or attorney. During this difficult time in your life it is important to keep in mind your ultimate goal – to be covered and protected – and to relay that goal to the LTD carrier’s advocate group or attorney who you have been referred to. This blog will explain your options for your SSDI case when you have LTD benefits, as well as, what you should do if your LTD carrier refers you to an advocate group or attorney so that you can ensure your goals are being met. What You Should Do If Your Long-Term Disability Insurance Company Refers You to an SSDI Advocate Group or Attorney? If your LTD carrier refers you to its own advocate group or attorney, keep in mind that you are not required to retain this specific advocate group or attorney. You are allowed to hire any representative that you want to assist with your SSDI case. All Social Security representatives charge the same type of fee for their representation. The LTD referral is no cheaper than any other attorney in your area. Sometimes the LTD carrier will tell you that the group or attorney that they are sending you to does not cost you anything up front, keep in mind that this is also the case with a local attorney of your choice. All representatives charge the exact same rates under Social Security’s rules. The only difference between an attorney of your choice and your LTD carrier’s attorney is that the LTD’s attorney may send your LTD carrier a cut of their fee as part of their referral arrangement. Your Long Term Disability carrier’s ultimate goal when referring your SSDI claim to this advocate group or attorney is to get you approved for SSDI as soon as possible. This is most likely also your goal. Your LTD carrier wants you to be approved for SSDI because, if you are approved for SSDI then your LTD benefits will terminate. This is the case whether or not you use the advocate group or attorney that the LTD carrier suggests. 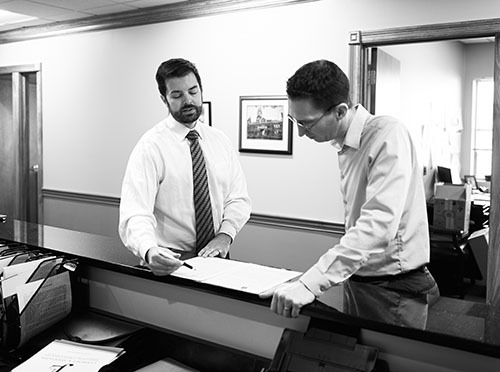 Do You Prefer a Greater Cincinnati Area Law Firm, Where You Can Meet Your Attorney Face to Face? The advocator group or attorney that your LTD carrier refers you to will most likely be a large national group or firm. This is not necessarily a bad thing, but there are things to be considered. Chances are with a large national group or firm you will never meet your attorney/ representative until the day of the hearing. This can make for an impersonal process, which can make you feel like just another name on a list and can potentially result in the representative or attorney leaving out essential information in your case. Meeting with your attorney/representative prior to your hearing is important so that your attorney/representative can fully prepare themselves, and you, for what to expect during the hearing. A local attorney/representative is more likely to go over your file and prepare you for the questions the judge will ask you at least a few days prior to the day of your hearing. This more personal experience can help you feel confident and prepared going into the hearing. Searching for the Right Social Security Attorney. Remember, you have the right to choose your own attorney. Do not feel like you have to use the attorney or representative that the LTD carrier suggests. The Social Security Disability application process can be overwhelming. You should find a disability attorney who you like and trust. No matter who you decide to retain, be sure to communicate your ultimate goals and interests to your attorney. Retain an individual who makes you feel confident and comfortable with their legal representation. A good Social Security Disability attorney will ensure that you have a fair hearing. It is important that you choose an attorney who is familiar with the Social Security laws so they can offer you the best chance at getting your claim approved. It is important that you do not sign any forms or contracts that your long-term disability carrier sends you regarding the SSDI process until you have researched the firm and you are confident that they are the right fit for you. If you decide not to use the representative that the LTD carrier suggests, and instead hire someone else, be sure to inform your long-term disability carrier in writing that you have retained an different attorney and provide the LTD carrier with your attorney’s name and contact information. Finding an attorney willing to take your Social Security should not be very difficult. However, finding a qualified disability attorney can be a tough process. Whether you use the representative that the LTD carrier suggests or someone of your own choosing, you should ask the right questions to determine whether the attorney truly has your best interests in mind. The first question you should ask is how accessible the attorney will be. Some social security attorneys handle large volume of cases, because of this, an attorney may not be able to provide adequate individual attention to your case. This should be one topic of your conversation. If your attorney understands your concerns and needs in the beginning, future misunderstandings can be prevented. Next, make sure the attorney has experience in the field of Social Security. This will ensure the attorney understands the nature of the Social Security Disability claim process. Finally, make sure you and your attorney get along. You want to trust your attorney and you want to make sure they have your intentions and goals in mind. The process will run much more smoothly if you hire a representative who will work hard for you, no matter if they are part of a national or local organization. If you feel like a local firm is a better fit for your needs, Lawrence & Associates may be able to help you obtain the benefits that are owed to you by the Social Security Administration. We are strong advocates who focus on individual attention and stand up for your right to recover the benefits you’ve worked hard for. The Social Security Disability process can be exhausting, but with us you will have a personal experience with a local attorney for the same rate as a national organization recommended by your LTD carrier. We’re Working Hard for the Working Class, and we want to help you! This blog is designed to provide you with an easy understanding on how three important factors – age, education, and residual functional capacity – all work together to determine the amount of Social Security Disability you may receive. How is Residual Functional Capacity Determined? There are many factors to be considered when determining if you can collect Social Security benefits. One important factor is called residual functional capacity (RFC). When determining your ability to work, Social Security evaluates your residual functional capacity. Social Security will assess the types of activities and tasks an applicant can still perform on a regular and continued basis. A Social Security disability claim will only be approved if it is established that you cannot perform any work. The Code of Federal Regulations, defines residual functional capacity as what an individual can do despite limitations. Residual functional capacity will take into account all limitations and medical conditions. In other words, Social Security will evaluate how much you can do and how long it will take to perform the function. A Social Security claim examiner will assess all impairments, including serious and minor impairments when evaluating residual functional capacity. Manipulative or postural activities are assessed such as reaching, handling, and lifting. Environmental conditions are considered such as the ability to tolerate high and low temperatures or wet and dry conditions. The RFC also encompasses mental conditions such as the ability to maintain concentration and attention for extended periods of time. Also, how well you can understand and remember duties throughout the day are considered. When these important factors are not clearly explained in your medical records, Social Security often finds you can perform these functions. It is important your doctor assess your ability to twist, bend, reach, grasp, kneel, and climb. Social Security also takes into account nonexertional factors such ability to follow directions; perform work at a normal rate and persistence throughout the day; and one’s overall reliability. What happens if one retains Residual Functional Capacity? If residual functional capacity is obtained to perform any common work in the national economy, an individual will not be found to be disabled. If Social Security examiners determine you can perform light, semi-skilled work, examiners will compare your residual functional capacity with those in the Dictionary of Occupational Titles and will match you with any jobs listed in that publication which call for light, semi-skilled work. What is the importance of Residual Functional Capacity? A complete understanding of all the factors that go into residual functional capacity determination is important for you to have a successful Social Security disability claim. In the Cincinnati Social Security office, medical records are an essential component in the determination of residual functional capacity. Often times, many of the factors such as bending, twisting, and kneeling are irrelevant to a doctor’s actual treatment of a medical condition. However, they are important for a Social Security Administration (SSA) examiner in determining benefits because SSA focuses on your functional ability not just your medical history. How Does Social Security Determine your Social Security Benefits Eligibility? Social Security uses your “Full Retirement Age” to determine the amount of monthly income you will receive. Full retirement age is based on your year and day of birth. Full Retirement Age determines when you are able to receive your full benefit amount. If you have started claiming benefits before your full retirement age, you become eligible for delayed retirement credits. What is the difference Between Retirement Age and Stop Work Age? Retirement age and stop work age must be distinguished in order to get a better understanding of how age can affect Social Security benefits. According to the Social Security Administration, your retirement age is the age at which you begin receiving Social Security retirement benefits. Stop Age is the age at which you leave the labor force and no longer work. This age affects the amount of Social Security benefits you may collect. Retirement benefits are based on your highest 35 years of earnings and your age when you start receiving benefits. What Happens if you Stop Work Before your Retirement Age? Social Security Administration will use a zero for each year without earnings, then they complete their calculations to determine the amount of retirement benefits you are due. If you stop working between the age of 62 and full retirement age, you may receive reduced benefits. The earliest you can start receiving retirement benefits is age 62. If you retire when you reach full retirement age, you will receive retirement benefits. In the Greater Cincinnati area, many individuals often work past full retirement age. Here, you are presented with two options: you can work and get full retirement benefits no matter how much you earn; the second option is to delay getting retirement benefits and earn credits that increase your benefit amount. Are there any consequences of claiming Social Security Early? There are consequences for receiving Social Security benefits early. If you are married you are reducing the survivor benefit available to your spouse. This will occur if your benefit amount is greater than theirs. Next, if you claim Social Security Benefits before your full retirement age and continue employment and make too much, then benefits will be reduced. It is important to note; investment income does not count toward the annual earnings limit. The only income that counts is income earned by working. How does Education Affect Social Security Disability? When applying for Social Security Disability, the Social Security Administration will ask what is the highest level of education you have completed. This information is used to assist with determining what kind of work you are capable of performing given your age and impairments. Education level can be measured to determine one’s ability to adapt to skilled work. The presence of additional education does not necessarily mean you can perform skilled work. A judge may determine the education you have received is outdated that it doesn’t affect your ability to perform present work. If you are over the age of 50, it is important to have your education evaluated. The rules assume that older individuals who cannot perform their past work because of physical and/or mental limitations will have the hardest time adapting to new work given their again. Therefore, it is generally easier for older individuals to be approved. Age, education, and residual functional capacity all work together to determine the amount of benefits you will receive. It is essential for you to know how these are assessed and we want to make it easier for you to receive benefits. At Lawrence & Associates, we want to help you recover the benefits you have worked hard for. We’re Working Hard for the Working Class; call us today for a free, confidential consultation! SSDI: What Can Cincinnati and Northern Kentucky Residents Do to Help Their Social Security Disability Cases? In order to receive social security disability, you must go through a five-step sequential evaluation process by the Cincinnati branch of the Social Security Administration. During the fifth and final step of the sequential evaluation, the Social Security Administration must prove that work exists for you in the national economy that you will be able to adjust to considering your impairment(s), age, education, and past work experience. If they cannot prove that work exists for you, then you are found disabled. To have a ruling in your favor, there are a few simple things you can do to help. Attending all of your medical appointments and keeping a log of all of those appointments is very helpful. Making sure to also track your symptoms, your medications, and the side-effects of your medications. Lastly, making sure your doctor is writing detailed medical reports and stating his medical opinion about your impairments and how they limit your abilities in your work life can be extremely helpful to lead to getting disability. Firstly, making sure that you attend all of your medical appointments is very important to your claim. In Northern Kentucky and Cincinnati, the Social Security Administration uses your medical records to determine if you are disabled or not. If you fail to attend your medical appointments that also means you are failing to obtain medical records, which means the Social Security Administration will have nothing to base their determination off of for your disability. The more medical records you have the more proof you have to show that you are severely and permanently impaired and ultimately unable to work. Secondly, along with attending your medical appointments, keeping a log of all your appointments helps your case as well. Write down when and where you were treated, who you treated with, and what impairment you were treated for. It makes it easier for your attorney to obtain the proper medical records and have a record of every time you went to the doctor. Along with keeping a log of your appointments, also make sure to track your symptoms. Keeping a daily log of your impairments and how they affect you gives your attorney more information that they can use to win the case. Along with this, also track your medications with their corresponding side effects. Keeping a log of everything speeds along the social security process and helps everything run more smoothly. When you go to your medical appointments it is also important to ask your doctor to write detailed and clear medical reports. Generally, when doctors write their medical records, they are writing them for themselves. They often times neglect being too detailed and instead write quick and concise notes. Ask your doctor for a medical report that includes a detailed narrative that explains all of your impairments and functional limitations. The Social Security Administration reads through all of your records and a detailed narrative is very helpful to you case. You should also ask your doctor to include his medical opinion in your medical reports. Have your doctor state whether or not they believe that you are so severely and permanently disabled that you should not and cannot return to work. While the Social Security Administration will not take your doctor’s opinion as their answer, having your doctor’s opinion in your medical records can help prove that you are disabled. It never hurts to have more than one opinion attesting to your disability. Along with asking your doctor for a more detailed medical report, also ask them to complete a Residual Functional Capacity (RFC) report as early in the process as you can. A Residual Functional Capacity report is an accounting of your capacity for full-time work. It allows your doctor to check off boxes allocating your limitations, like how much you can lift, how far you can walk, and whether you can bend or stoop. It is a great way for the Social Security Administration to get the information they need to make a determination of your disability. Another thing you can do to help your case is making sure you are seeing the appropriate doctors for your impairments. While it is convenient to see the same doctor for everything, it is important to make sure you are receiving care from doctors that specialize in the area in which you need treatment for. For instance, instead of seeing your primary care physician for your mental health impairments, you should see a doctor who specializes in mental health, like a psychiatrist. This will ensure that you are getting the best possible medical records and opinions from someone who specializes in the disability that you have. Lastly, strong communication and cooperation with your attorney is very important. It is crucial that you come to all of your meetings with your attorney and are easy to get a hold of. Making sure to fill out the forms we give you correctly and in a timely manner helps the social security process move along quickly. If you have questions about the process or are confused about something asked on one of your forms you have to fill out, it is best to contact your attorney instead of guessing. The fifth step of the sequential evaluation by the Social Security Administration is the final step in determining if you are considered disabled or not. If they cannot prove that work exists for you, then you are found disabled. There are several ways you can help bring about the result you want in this fifth step along with your case as a whole. Make sure to attend all of your medical appointments so that the Social Security Administration has medical records to base their ruling off of. Obtaining good medical records and opinions by the appropriate doctors as well as having your doctor fill out a Residual Functional Capacity report goes a long way. Keeping a detailed log of your symptoms, your medication and its side effects, and a list of all of your medical appointment dates and your provider is also very helpful. If you believe you have a Social Security Disability claim, don’t go it alone. Lawrence & Associates has helped many Cincinnati and Northern Kentucky residents just like you get disability benefits. We’re Working Hard for the Working Class, and we want to help you! Call today for a free, confidential consultation.